I am number 899 in the Ravelry queue! In anticipation of the access I will have to information on patterns and yarn, I took a little bit of time yesterday to photo-document my growing stash. In the beginning (about 8 months ago) I bought yarn and colors I liked, without really understanding weights and yardage. Translation : I have lots of single skeins for hats, mitts, gloves, etc. I am just now beginning to purchase enough of a single yarn/color to be able to “do something”, even though I may not be sure what that is. Here are a few of my more recent purchases — what do you think they should become? This is churro wool. I bought this from Earth Arts at a local fiber festival I accidentally discovered while out running errands this spring. These are the natural colors of the sheep, which are the breed traditionally herded by the Navajo. From what I understand, this wool is most often used in rugs and weaving, because it is very strong. It is scratchy, but I love the colors. Perhaps a doormat? 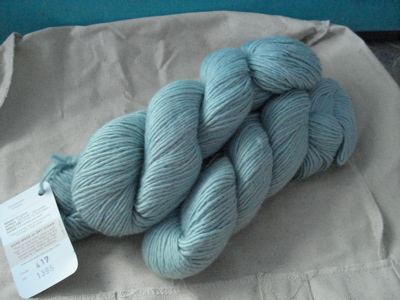 This is Blue Sky Alpacas Suri Merino in Seamist. 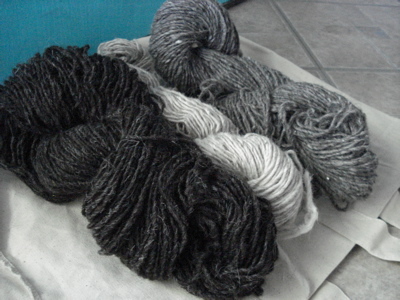 I have three skeins. This is most certainly for me — so soft! I bought this at Loop during a recent trip to Philadelphia. I’m thinking it should become a scarf or mittens or a neck warmer…something that will let me enjoy how nice this feels against my skin. 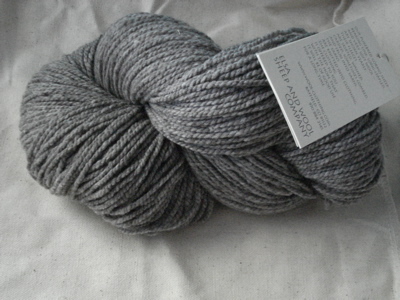 I am very excited about this: Elsa Sheep and Wool Cormo wool worsted in a gorgeous heather grey. I have 1000 yards of this, and I am thinking it should become a cozy cardigan with overlapping fronts. Maybe the Pimlico Shawl from Knit2-Together, or a Debbie Bliss pattern with a big ribbed collar? Happy sunshine! It is clear and cold here today: a perfect fall morning. Boh and I have some frolicking to do, and then I’m off to watch yesterdays’ Rugby World Cup Final and consolation match. Shhh! I don’t know the outcomes yet.